I have a couple of personal observations about Puerto Galera. First, White Beach is the most popular beach in Puerto Galera among Filipinos, while Sabang Beach, our featured destination for tonight, is most popular among foreigners. Second, this makes White Beach the Malate of Puerto Galera while Sabang Beach is Galera’s equivalent of Ermita in Manila1. Agree? I actually find foreigners’ affinity with Sabang Beach quite puzzling. I have never stepped foot on Sabang Beach and I probably won’t since Sabang Beach is hardly a beach at all! As can be seen from the satellite imagery in Google Maps, there is no expansive stretch of sandy shore that’s present in White Beach. Additionally obvious from the satellite image is the presence of rocky corals in the water making swimming somewhat unsafe unlike in White Beach. These things make Sabang Beach boring in my book. Then again, the nightlife in Sabang Beach, I heard, is livelier than in White Beach with numerous bars and restaurants packing this tiny district. I suppose there are also a lot of girlie bars? Hehehe. Moreover, if you’re into scuba diving, Sabang Beach is a better base of operations since it’s near all the nice diving spots of Puerto Galera; White Beach is too remote to be a popular scuba headquarters. As evidence of Sabang’s popularity among non-Filipinos, the Wikitravel page on Sabang is quite extensive whereas White Beach’s page doesn’t exist at all2! 1 Malate and Ermita are the two most cosmopolitan districts of Manila, both with a vibrant nightlife. 2 Wikitravel is like a Wikipedia-style travel guide; unlike Wikipedia which has an active Filipino editor community, Wikitravel doesn’t and so foreigners are the active contributors on that site. About the beach in sabang….why would someone want beach and swimming? Perhaps children or those with the same level of maturity. @meat, you’d be surprised at how many people would go to the beach to swim, children or adults alike. It’s not often that people from Manila go to the beach and swimming is a large part of the seashore experience. Regarding prostitution in Sabang? No comment. 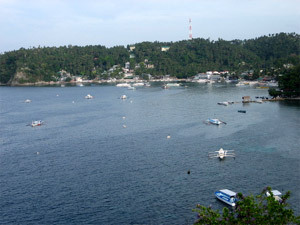 Sabang’s popularity among foreign tourists sustains itself. If you know other foreign tourists like it there, then it is probably a safe bet. As for diving, you almost need a diving instructors certificate to hold a conversation in Sabang. The night life is long and lively, and it is possible to find a night club where there is a dance floor for the customers to dance on. Though it is not easy. @James, thanks for that bit of info. I’m having a hard time deciding on where to stay at Puerto. Can anyone compare Coco, Talipanan and Sabang? Big thanks in advance! BAYVIEWPALM IS A SMALL HOTEL ON THE HILLTOP OVERLOOKING SABANG BEACH WITH FANTASTIC VIEWS . I stayed in both white beach and Sabang and had my Filipina gf with me both times. Foreigners feel safer when there at a place where many other foreigners of different nationalities congregate. The food at the restaurants are more to what they are used to and don’t find everywhere in the places mostly patronized by Filipino’s, like steaks or hamburgers for example. Anywhere in any country where money can be found freely floating around draws street vendors, sun glass sales and souvenirs and prostitutes. The water was clear and had rocky bottom with many fish,although no coral formations, but,white beach didnt have any coral either.Nightlife is more active in Sabang but on the farther end of the strip,there is several hundred yards of hotels that are quiet and not glitzy or so wild. I dont go out to nightclubs, but would stay at Sabang instead of white beach ,also the hotels are much better in Sabang. I been to White Beach many times but would like to try Sabang this time alone… I am a filipina beauty and do you think going there alone is not a good idea? They might think I am one of the prostitute? would like to see the comments. I have been in white beach, the water is clear and clean, tho left part of th4 beach is ok, but the right side is so rocky, food two years ago is still affordable, but during the night time its boring, so we just stayed in our hotel and swim in the pool. i would like to try sabang, but when i searched for it, some says that sabang beach is not good for swimming, so maybe i try laiya beach in batangas na lang. I was just in sabang by myself… 2 days ago.. yeah the beach is good.. well it’s funny coz I didn’t get a chance to swim to the beach.. well because I was just trying to finish my project in schoool but I would love to go back to the island with some friends or someone.. so that wouldn’t be so boring.. I never seen white beach but I would love to visit instead of sabang maybe.. and yeah I’m not into nightclubs… just for swim and whatever..
May Yao it depends but yeah I tried it so why wont you.. just be careful..